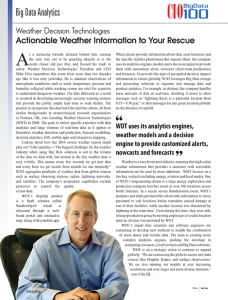 Weather Decision Technologies acknowledged on CIO Review’s 100 Big Data Companies list for its innovative information with Big Data as it applies to hazardous weather detection and prediction, forecast modeling, decision analytics, GIS, mobile apps and interactive mapping. NORMAN, Okla. - FREMONT, Calif.– May 20, 2014 – CIO Review has chosen Weather Decision Technologies, Inc. for its 100 Most Promising Big Data Companies in the Big Data Analytics arena. The positioning is based on evaluation of Weather Decision Technologies’ offerings of a WaaS® (Weather as a Service®) solution called WeatherOps® which is delivered through a web-based portal and interactive map, along with a mobile app. When Weather Decision Technologies’ clients provide information about their asset locations and the specific weather phenomena that impacts them, the company uses its analytics engines, models and a decision engine to provide these customers with customized alerts, nowcasts (short-term predictions) and forecasts. This annual list of companies is selected by a panel of experts and members of CIO Review’s editorial board to recognize and promote technology entrepreneurship. CIO Review constantly endeavors to identify "The Best" in a variety of areas important to tech business. Through nominations and consultations with industry leaders, our editors choose the best in different domains. Big Data 100 is a listing of 100 Most Promising Big Data Companies in the U.S.